This is an excerpt about Oguz tamgas from Abulgazi Bayadur Khan work. For comparison, Abulgazi record is complemented by Rashid-ad-Din and M.Kashgari records. In one instance, we have a confirmation of the 16th c. Abulgazi information by the 4th c. Chinese annals, it is a case of the Alachin tribe, in likely Mongolised form Alat, who in 350's joined in with the ancient Yan state, and from that time inaugurated the ethnonym Yemek. We can be positive that Abulgazi had a copy of Rashid-ad-Din work, and one of the tasks that Abulgazi endeavored to accomplish was to correct erroneous records of previous authors. Some “corrections“ may be erroneous, because the status in the 17th century must have differed from the status in the 9th c, especially considering the westward migration of the Oguz tribes, and compositional changes intrinsic to any migration or expansion, and they may provide information on the dynamics of the developments in time and space. Notes and explanations of the posting added to the author's text and not identified specifically are shown in blue parentheses (). Page numbers are shown in the Table of Contents in the beginning of the page, for convenience of navigation they are supplied with the pages numbers of PDF/DJVU file. To avoid font conflicts, the text of the Russian translation is given in modern spelling. The copyright for the 1778 publication has expired long ago, it is in the public domain. The meaning of the [name] Kaiy 3 - strong, its tamga is , its ongon is krechet (The narrative listings are converted into the table below). 1 In modern Turkmen language the word tamga is used in the forms tamga and tagma (see: X. Bailiev and E.Karryev. Turkmen-Russian dictionary, 1940, page 274; see also: G.I.Karpov. Clan tamgas among Turkmen, pages 43-49. The base of the word tamga, in the A.C. Emre“s opinion, is a verb tam - “burn bright“, “fire“, “kindle“ (A. С. Emre. Tuerk Dilbilgisi, page 174). Tamgas and their images are recited by Mahmud Kashgari (vol. 1, page 56) and by Rashid-ad-Din (vol. 1, Book 1, page 87-91; I.N.Berezin. Rashid-Eddin, page 25 on); They considerably differ from each other. The tamgas of the tribes Teke, Salyr, Saryk, Nohur, Goklen and Yomud are published in the mentioned above article by G.I.Karpov. The main literature on the subject is also listed there. Also see: G.I.Karpov. Tagma (Clan tamgas among Turkmen, page 29-35). 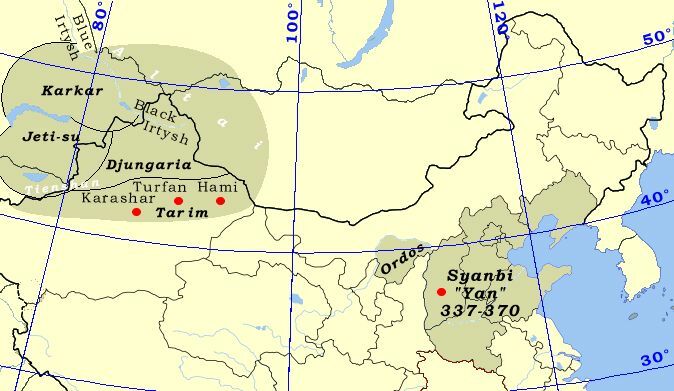 Tamgas of the North Caucasian Nogays, a part of which outwardly are very similar with those of the Turkmen, (page 132-140) are published in N.A.Baskakov“s book “Nogai language and its dialects”. For literature on the subject see: N.A.Aristov, Notes, page 12, comment 1; A.N.Bernshtam. Socio-economical organization, page 14, comment 7; A.K.Ali-Zade. The term "tamga", page 51-63; G. Vernadsky. Note on the origin of the word "tamga". 2 In the text - kush “bird“. Rashid-ad-Din (vol. 1, Book 1, page 87; I.N.Berezin. Rashid-Eddin, page 24) gives, as always, a fantastic interpretation of the term ongon. (Rashid-ad-Din: “This word comes from "inak", and inak in Turkic means blessed, as is said: “inak bulsun!“ - i.e., let it be blessed! And existssuch custom, that everything that is the ongon of a tribe, they do not assail it, it is not resisted, and it meat is not eaten, because they adopted it as a favorable omen. This sense remains in force till our time, and each of those tribes knows their ongon.“) I.N.Berezin (Ibid., page 224) compares the word ongon with a Türkic word *** “god“ (also see: I.N.Berezin. Sheibaniada, page 80). A work of D.K.Zelenin gives a broad presentation on the institute of ongons “Cult of ongons in Siberia”; also see: Abduelkadir [Inan], Ongon ve Toes kelimeleri hakkinda, 277-285; Rashid-ad-Din, vol. 1, Book 1, page 87, a comment l.
3 The names (their meaning), tamgas, ongons and sacrificial parts of meat that are recorded by Rashid-ad-Din are now known in three Russian translations: Rashid-ad-Din, vol. 1, Book 1, page 87-91; I.N.Berezin. Rashid-Eddin, page 25-29; MITT, vol. 1, page 500-501. An attempt to etymologize the names of the 24 sons of Oguz-khan were endeavored by I.N.Berezin (Rashid-Eddin, page 224-226). 4 Humai - a mythical bird (L.Budagov, Comparative Dictionary of Turkish-Tatar Vernaculars, vol. 2, page 315). 5 The parts of the lamb and the prominence of the tribes are correlated; the most honorable guest receives the best part, it is a part of a ceremony that reflects and designates the relative standing of the tribes, and their position in the battle line-up. The profound changes in the parts of the ceremonial meat, unless recorded incorrectly, reflect the relative changes that occurred between the 9th c. and 17th c.
6 Of the forms Alka-oili, Alkabölük, Alkaevli, Al-karauli, the Al-karauli is an oldest record, with a clear component “karauli“ meaning “guard post“, “guard postman“, and “guard postman service“, indicating the role of the Al tribe in the confederation or its immediate predecessor. It appears that the earlier Al-karauli, combined with later determinant adjectives, shrunk to “Alka“, changing the root of the tribal name from “Al“, possibly “Ala“ = “motley“, to “Alka“. The new determinant adjective was variously transcribed as “oili/uili/evli“ and “bölük“. 7 The tribe Ala-yontly, Ulayundluğ, Alayund, Alayuntlu, Alayurtlu, Alayuntli, whose name contains “Ala“ = “motley“, defined as “with skewbald horses“, in the literature is called Alats/Alachins/Seyanto, in Chinese annals goes under Boma and Bugu, its Chinese description for a time was puzzling the early researchers. The entry under the year 357 notes: "Leader of Sünnu (Huns) Shanyu Heloγ Tou (i.e. Ala-at Tou/Alat Tou, "Skewbald Horses tribe", in Chinese "Boma", [tamga ]), leading 35 thousand submitted to (dynasty) Early Yan (Syanbi state Former Yan/Sixteen Kingdoms, simplified Chinese 前燕, pinyin: Qiаn Yаn, 337-370). Apparently tribe [Yan]to are their descendants. [Yanto] lived intermixed with tribe Se (Sir/Sary), therefore they are called Se-yanto. Surname [of Kagan clan] Ili-tu (Il-ter). From generation to generation [Se-yanto] were a strong tribe". Seyanto and Bugu had identical tamgas. These Alats/Alachins/Seyanto/Boma settled inside Early Yan territory, east of Ordos and north of Huanhe. 8 The tribe Bunduz, Bügdüz, Bukduz stands out between its three kins with superlative descriptors “great“, “high-ranking“, and “respectable“, pointing to a subservient status of “helpful“. That tends to imply a kyshtym “vassal“ status of the Bunduz tribe, and a former “master“ status for the Igdir tribe.